The rise of digital media has revolutionized the management of information and created opportunities for broader involvement in science's production. Collaborations are growing ever larger, transforming the concept of authorship. Prepublication discussions of research on blogs dilute a principal author's claim to discovery. And the public is increasingly involved. It is amazing to read Ravetz's strong argument for new social practices in science in Nature, the world's leading scientific journal. In publishing this comment, Nature demonstrates that it knows well to read the signs of the time. Already on the "Science in a digital society" workshop in Lisbon in March 2011, an editor of Nature reflected on the changes the blogosphere and other emanations of the digital media might bring for Nature and scientific journals in general. There is definitively something going on! The journal is losing its status as the sole gatekeeper — simultaneous guarantor of quality, certifier of property, medium of communication and also archive. Other means of sharing material, assessing quality and screening out the incompetent or fraudulent are emerging to fill the gap, but ultimately the professional monopoly on quality assurance of science will have to be modified. The blogosphere holds, according to Ravetz, "great promise for free information sharing". For him, positive examples are the defense by climate scientists of Steve McIntyre; or in medicine, the employment of thousands of "expert patients (...) to review the quality of research papers on treatment"; or the general virtues of "whistle blowing" in the blogosphere. In the wikipedia-like communitary 'open source' and 'creative commons' production of knowledge, Ravetz sees even the fulfillment of Merton's ideals (communalism, universalism, disinterestedness, originality and scepticism). For this to happen, barriers to sharing scientific information with the public, such as journal paywalls, should come down. And better online discussion forums must be developed. The presentation and archiving of blogs and other forms of internet communications should be improved, so that ideas can be debated and added to over time. In the discussion, Jerry Ravetz rightly mentions Judith Curry's (who has also a discussion of Jerry Ravetz's comment) and Anthony Watt's blogs as good examples for keeping the standards high while having successfully established rules of courtesy. I think our contributors and readers might agree that our 2-year-old klimazwiebel is an active part of this exciting movement towards more open, democratic and collective practices in science . 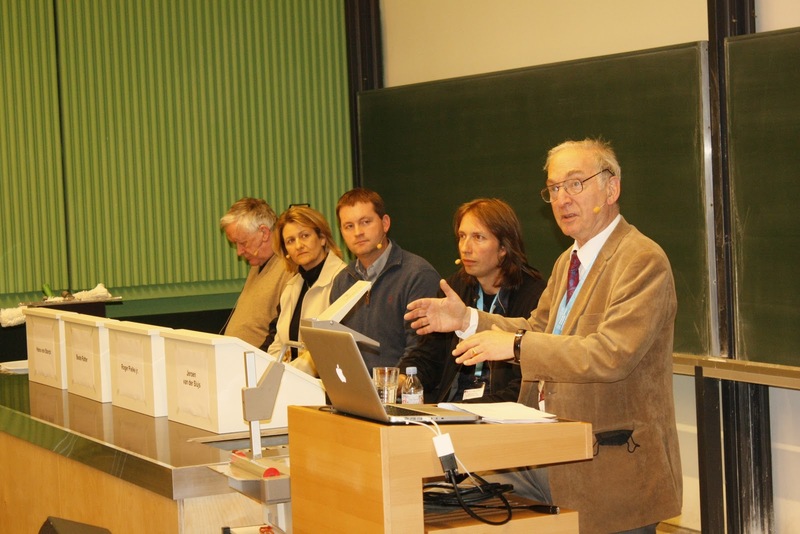 (Photo by Sarah Pleger & Caroline d'Essen: Jerry Ravetz, Jeroen van der Slujis, Roger Pielke jr., Beate Ratter and hans von Storch in Hamburg 2011, workshop on "postnormal science: the case of climate research"). Any civilized discussion needs a consensus of shared values, but physical science (to be fundamentally distinguished from sociology) needs to be continually focused upon the physical facts, not theory which too easily slides into unsupported or even wrong speculation. The idea of "theory" is just that of nascent, or hopeful, dogma, and the idea of "established theory", just unquestioned dogma. If it is true to the physical reality, the facts, all well and good; otherwise, as we see in climate science (and across the board in science, especially in the earth and life sciences), it becomes actual tyranny, a false consensus of opinion, rather than a consensus of knowledge (real understanding). you seem to be one of the few people who know what "physical reality" and "the facts" are. In the discussion, Jerry Ravetz rightly mentions [...] Anthony Watt's blogs as good examples for keeping the standards high while having successfully established rules of courtesy. It's a joke, isn't it? Or does Ravetz live in a fantasy world? Comment #2 below the Nature article sums up my opinion pretty well. Great post on the same topic over at Roger Pielke's blog http://rogerpielkejr.blogspot.com/. "If the goal of public discourse is to divide people along partisan lines, to raise their intensity and to demonize one's opponents, then Krugman no doubt has the correct strategy. But if the goal is to help society pursue common interests, to open up opportunities for compromise and to reinforce the integrity of institutions, then Ravetz surely has the more appropriate approach. Society is a big place and there is plenty of room in the blogosphere and elsewhere for Krugmans and Ravetzes -- both play important roles in a democracy. However, for the scientific community broadly, Ravtez is correct that science is more constrained in its options -- seeking to be "respected by both sides" is not just the right thing to do, but it is the only way that science will sustain as an effective institution in the broader society." No, I don't think, that R. Pielke provides answers regarding the questions in the link I presented before. Dividing people along partisan lines is of course not the goal, rather the status quo. I prefer an inconvenient truth to a courteous stupidity. "I think our contributors and readers might agree that our 2-year-old klimazwiebel is an active part of this exciting movement towards more open, democratic and collective practices in science." Yes, but you pay a prize. It's easy to reconcile, if you avoid hot discussed items. It's easy being respected by skeptics, if you write criticisms about IPCC or Rahmstorf. But I wonder, what reactions we could see, if you write about, what science says about expected temperature rise by doubling CO2, about BEST or about the Svensmark effect. What, if Klimazwiebel would make some efforts to correct nonsense like this at WUWT? How to deal with demagogues? Ravetz mentions Lyssenko, but doesn't give advice how to deal with. Yes, Werner, you found some kind of peace with the skeptic side, but you've gotten partially dumb. Why don't YOU correct the WUWT nonsense? I'm sure Klimazwiebel would be glad to publish it. Oh! I forgot. You are not an expert. Neither am I. But that did not prevent me to analyze the Arnell (2004) paper (here and here and here) and arrive at conclusions that run counter to those of some other sceptics on this blog. Of course, analyzing a technical paper is a bit more difficult and takes a bit more time than shouting from the side-line. So I got "partially dumb"? Is there any help possible? Andreas, I think you got confused by my remark that WUWT is "rightly" mentioned as an example "for keeping the standards high". I have no problem when you question this. The main problem here is that you obviously did not get the point of Jerry Ravetz's comment (or that I did not present it correctly, but you can read the original comment). The comment is about "Digital media and the sociology of science". You might agree that the blogosphere has changed science as a social practice. For example, you (whoever you are) can make your voice being heard all over the place (just look at the spatial distribution of klimazwiebel on Hans von Storch's post on 2 years klimazwiebel). And it is interesting to note that even Nature, the journal, thinks about the changes the blogosphere brings. They KNOW that the link between research, peer review, publication, hide it behind a paywall etc will not last forever. You, Andreas, as a consumer of science, you get more and more access to peer-reviewed articles (or when they are in the making, or in discussion on blogs) than ever before without having to be a member of a university with flat rate for Nature etc or simply having to pay for the articles. And you can comment on those articles. And even publish own ones. The link between capitalism and science shifts towards knowledge and democracy (if I express this correctly...). Jerry Ravetz sees an opportunity in this development. How to deal with demagogues if Nature's peer review or other authorities don't keep them at bay? Beat them up? I recommend openness and democracy and active participation. Just like you do, obviously with great pleasure even on klimazwiebel. And, indeed, trust. But anyway, thanks for your repeated advice not to become too comfortable, lazy or even partially dumb. I take that seriously, promised.